Do you love granola and fruit? 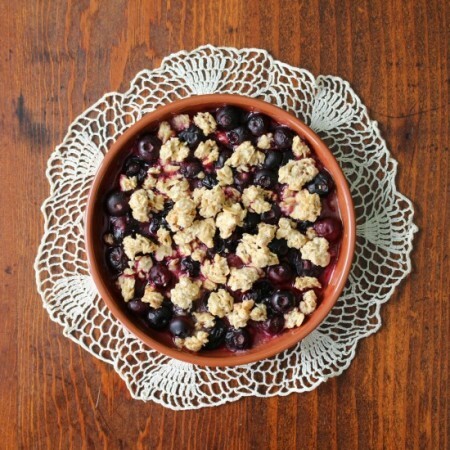 Then you’re going to love this blueberry granola mix-in recipe! It’s perfect for topping yogurt or ice cream. I am a huge fan of granola. I make my own homemade granola from time to time, and I also cycle through a wide variety of store-bought brands as the mood strikes. I am also a huge fan of fruit crumble for dessert. I’ve made blueberry crumble, blackberry crumble, and apple crumble, among others. I think it’s only natural that I would try to combine the taste of granola and fruit crumble in a recipe that requires only two ingredients and about 30 seconds to make. You can eat it just as it is, like a lightning fast blueberry crumble, or do what I do and spoon it on your yogurt or ice cream. Can you guess which one happens most frequently? I’ll bet (if you know me) you guessed the ice cream. And you’d be right. But I do love to put it on Greek yogurt mixed with honey as well. You can use any kind of granola that you like for this recipe. I’ve used at least 5 different kinds, and as long as you like the granola, it’ll work great. It works for breakfast, dessert, or snack time equally well. Kids like it, too, so keep it in mind for sneaking some fruit into their after school snack or evening dessert. If you’re looking for more great fruit ideas, you should also check out this easy cherry sauce recipe. It’s great for topping yogurt or ice cream, too. Try this fresh ginger ice cream for a real treat. Use fresh blueberries rather than frozen. 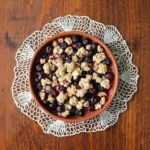 Use immediately after making, because the granola will soak up the blueberry juices and get soft if you try to store it for later. Layer this with your favorite vanilla yogurt for a fabulous parfait, or pour it over vanilla ice cream for a decadent treat! Put the fresh blueberries in a small bowl. Microwave on high for 30 to 45 seconds, or until the juices just start to run. Remove the bowl from the microwave. Sprinkle on the granola, breaking up any chunks that are very large. Microwave 20 to 30 seconds, or until the juices start to bubble. Let cool slightly so that the granola soaks up a bit of juice. Serve warm on top of ice cream, or let cool a little more and layer it with your favorite vanilla yogurt. Enjoy! Previous Post: « White Chocolate Strawberry Brownies Recipe | Perfect for Valentine’s Day! Anything with chocolate! The bitter the better! I’m not big on sweets! Something with layers of flavor and texture. Cookies, cakes and pies are ok but when I want DESERT..I want layers and textures! My favorite “texture” treat is apple crumble: crunchy topping, firm apples, slightly chewy apple peels, sticky sauce. Yum! I love anything granola!! And this looks delicious!! Love the cookbook too! I was able to do a review of this cookbook and loved it! I like cupcakes! They’re so fun to decorate, and even more fun to EAT! Who doesn’t love cupcakes? I am partial to vanilla cupcake with vanilla frosting. I love granola since it’s so versatile to change and add different ingredients. Even better that it’s gluten free! Yay! Hi Jules! So glad you stopped by. Nice to meet you in person, too! I love ice cream, too. I think I’ve been spoiled for store-bought forever, though, since I bought my ice cream maker. Fresh ice cream is awesome! I will eat ANYTHING with chocolate, especially if it’s paired up with the right fruit (orange, raspberry). I’m also a big fan of ricotta cheesecake! I’ve been meaning to try ricotta cheesecake for ages. There’s a recipe in “The Perfect Cake” that sounds doable. Chocolates are my favorite dessert. I love plain cheesecake because I like cream cheese. No judgment here! 🙂 It depends on your preference. You could toss chopped raw strawberries with the granola and add to yogurt. Ice cream, however, is a different story. Raw pieces of strawberries are not so good when they freeze, so you’d need to gently cook or puree the strawberries (or both) before topping ice cream. My guess is that strawberries probably wouldn’t behave the same as blueberries in a microwave because blueberries have so much more juice. I like cherry cobbler cause cherries are my favorite fruit! Yum! This looks amazingly delicious! 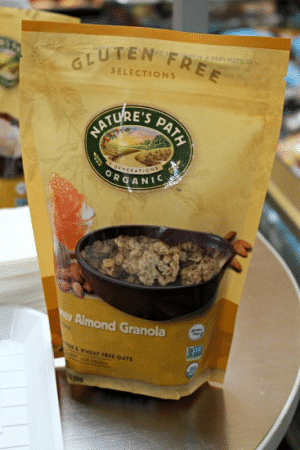 I love the fresh fruit and the fact that it is made with gluten-free granola! Yum! I love granola with fresh fruit! I have that very same cookbook and love it! Granola has definitely become one of my new favorite breakfast treats. Yours looks so good. My favorite dessert might be chocolate pudding pie! I mean, how can you go wrong?? honestly, i just love it ll. i have such a sweet tooth! What a wonderful treat for breakfast, or even lunch.